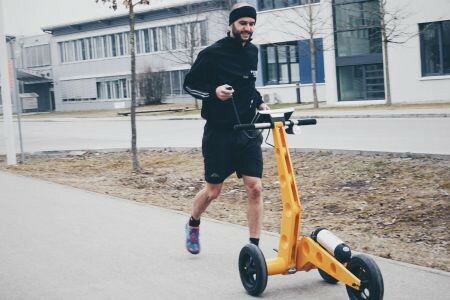 After a short introduction of runfun founder and CEO Prof Erwin Prassler, ESA BIC Project Manager Fabian Lindermer was ready to test the robotic running coach “RUFUS”. The coach has several programmes and with an easy to use interface. Thereby, it is possible to set up the pace and keep up with the robot. The options of installing personal training programmes or cardio trainings adapted to your personal fitness level provide efficient assistance in terms of mobility, fitness and health. “The interface is very easy to use and after a two minute introduction you are ready to go”, says Fabian Lindermer. The product will be available for the current running season starting in spring 2017. For further information about the innovative product visit runfun’s website. runfun is a startup company in the area of service robotics with special focus on sports and health. The company’s team consists of engineers, product designers, and marketing professionals. It is their vision and mission to explore how robotics technology at large can be used in the design of cyber-physical systems that can assist human users in their indoor and outdoor sport activities, either as mere companions or even as robotic fitness coaches. The main purpose of these devices is to assist users in recovering and improving their personal mobility, fitness, and health. runfun is currently developing and commercialising a robotic running coach named RUFUS as the first product in their portfolio of fitness and health devices. runfun is incubated at the ESA BIC Bavaria from February 2015 to January 2017.